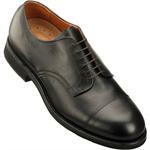 The Alden 324 is a fine men's casual shoe by Alden of New England. This tobacco, Algonquin, blucher oxford is constructed of oiled nubuck, calf leather uppers and lightweight, rubber outsoles. This unique system offers precise fitting and correction location with up to 3/8" insert depth. All C.D.I. shoes are manufactured to Alden's highest quality standard. Full leather Goodyear welt construction, supple full grain leathers, soft leather linings are combined with tempered steel shanks, long medial counters, and removable insoles for strong support with softness. Alden's C.D.I. 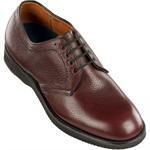 shoes offer a wide choice of styles, and better yet - a wide range of sizes and widths. No matter how difficult the case, Alden's C.D.I. shoes are a most versatile troubleshooter. that fits precisely in your Alden Shoe.